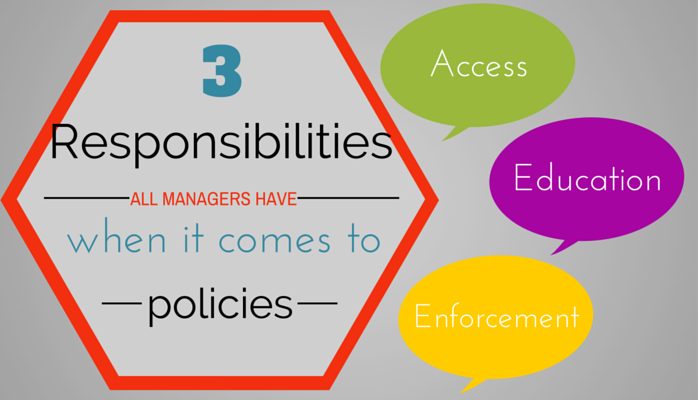 As a manager — no matter what your specific role within the organization or what size or type company you work for — you have three important responsibilities to your employees when it comes to policies and procedures: access, education and enforcement. When a new employee joins your company, who trains him/her on how to access company policies and procedures, and your department’s policies and procedures specifically? Do your employees know where your company’s policies are stored and how they’re organized? Are the policies easily accessible, or do employees have to hunt through share drives, Excel spreadsheets, email inboxes, company handbooks and physical folders for answers? Do your employees know how to find information when they have specific questions about a policy or procedure? When a new employee joins your company, who trains him/her on company policies and procedures? How do employees learn about new or updated policies and procedures? Do employees know the reasoning behind each policy’s creation (whether to comply with company ethics and mission statement; trade organizations’ guidelines; or local, state and federal laws) and why it’s critical they comply and uphold each policy? What happens when an employee comes to you with a question about the company’s policy on sick days, overtime, vacation, confidentiality about company information, taking lunch or a task related to his/her job function? Who is in charge of updating and refining your department’s policies and procedures? Do you participate in helping create, review or update your department’s policies? How do you lead by example and guide your employees in complying with your company’s policies? How do you carry out your job responsibilities and enforce company policies on hiring, firing, promotions or performance reviews? How do your employees help hold each other accountable? Because you play a key role in showing your employees how to access your organization’s policies, educating employees on policies and procedures, and enforcing policies, you’re also a policy manager of sorts, whether your main role is marketing, sales, accounting, HR or other departmental manager. After all, you most likely know your department’s specific policies better than anyone else. So if you hesitated in answering any of the above questions, or if it’s sometimes difficult to access, learn or enforce your company’s policies and procedures, it’s time to reevaluate your policy management system. What’s the most efficient way to access and enforce your policies, and educate employees on them? Consider automating all three processes with ConvergePoint’s Policy Management Software, and do away with policies updated via email chains, “organized” on Excel spreadsheets and stored in share drives. From creation through distribution and acknowledgement, ConvergePoint software manages the full policy lifecycle. Built on Microsoft SharePoint, the software stores all policies in one central document repository, enabling employees to easily access and find policies with powerful search functionality. It also allows managers to create quizzes or require acknowledgements that policies have been read and understood, and sends automated email reminders when a policy is up for renewal or retirement. Next step: After using Policy Management Software to streamline the access, education and enforcement of policies and procedures, learn how to hold your employees accountable to what they’ve read and acknowledged by reading our How-to Guide.